Bigger is not always better and size does matter, but it’s just a matter of what size do you need. 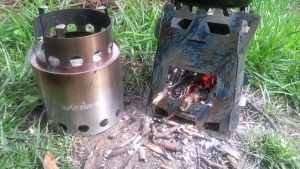 Last time when we reviewed a stove from MySurvivalPack.com we said something similar about the Core 4 Bio-Reactor Titanium Ultimate stove. It seems that this comment was taken to heart because a little while ago Chad emailed us and asked if we would you like to take the Core M4 stove for a spin. With the indication that this new variation was a more mini version of the original, and more Solo Stove sized, we easily said yes to that offer. The Core M4 stove as the original has a multitude of options for assembly. With our kit being the Bio-Reactor Ultimate setup we were privy to pretty much all of them. Making a reappearance in this version was the venerable Rocket Port, TLUD plate and the internal Afterburners, all of which, when used in combination allow the Core Stove M4 to efficiently re-burn the biomass fuel and gasses inside the stove. plate for the bottom of the stove. According to MySurvivalPack.com this is “…designed to protect the ground from heat damage, allow airflow under the stove and to allow the stove to be used on top of the snow” , as we didn’t have any snow in the area we didn’t give this feaure a test. Also they said alternatively it could be used as a griddle on top of the stove. I would have to say that this would certainly be an either or type of situation, or at least the plate would need a good cleaning in between these two uses. This is not the only direct cooking option included in the ultimate edition of the kit. A smaller grill specially fit for the Core M4 stove is included so one can easily cook up anything that is tasty on an open flame wood fire, which is just about anything. During our assembly we decided again to go with a simpler configuration being four walls, three Afterburners and the TLUD plate. 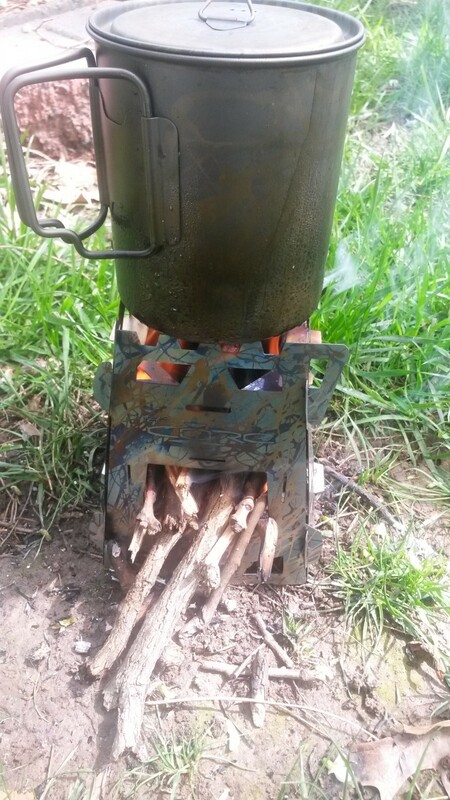 In our last test with the full sized Core Stove, it performed very well without the usage of the Rocket Port, and to stay consistent we decided to forego this option again. As we were snapping pieces together we came to realize that the Core Stove M4 is a bit more snug in the fit than its predecessor. For performance on the burn this is probably a positive, but for ease of assembly this was a touch frustrating. We found that the difficulty came from the TLUD plate, as it is cut so precisely to the overall size of the stove that one must be patient in the alignment process. Once we realized where we went wrong, everything came together perfectly. The overall size as promised is smaller than the original Core Stove, and certainly compares well with the original Solo Stove. Standing about as tall as the original Solo Stove with its pot stand on certainly emphasises this point. They both show a similar overall diameter of both the burn aperture and the available pot stand space, with the Core Stove M4 actually sporting more volume in the burn box. Since these two were so similar in size we decided to try fitting a Trangia alcohol stove in the TLUD plate opening on the Core M4 stove, but no luck. The opening was just a bit too small to accommodate the base of the Trangia. Staying with tradition it seems we always choose a day to test our woodgas stoves right after we’ve managed to have quite a deluge of rain. Given that we know we’re already working with less than perfect fuel, we set off to gather what was needed to get things underway. This led us to use our trusty old egg crate/lint/paraffin homemade fire starters that have always done us so well over the years, and this was no exception. Loading the Core Stove M4 with the starter and a hearty amount of moist wood we set the assembly ablaze and got this show on the road. 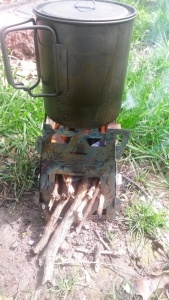 Our egg crate fire starter did it’s job well and also allowed the Core Stove M4 to make quick work of it’s initial fill of fuel. Once this started to burn down a bit we began to load the stove from the open front port as designed. Even without the Rocket Port installed the Core Stove was able to dry and then burn the larger wood as we fed it into the main body of the stove, pretty quickly. 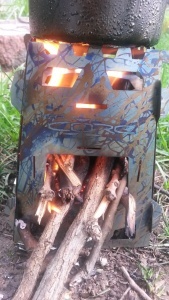 We have to say that this feature is probably our favorite of the Core Stove line. The fact that you can easy feed larger fuel into it, without breaking it up, and also allowing it to dry, is a great design. temperature water, being approximately 65F. Though the pot fit and rested on top of the smaller Core M4 stove we did immediately notice that we had to be a bit careful when we situated it. The pot we were using is pretty much the smallest diameter you could safely use on this stove, as it was just on the edge of the stand as we maneuvered it. While we were stoking the fire on one occasion we accidentally managed to have the pot tip over a bit and spill some of the water onto the fire. We quickly recovered and got everything corrected, but we certainly took notice to be careful as we handled things. With wet wood drying quickly and burning away, our titanium pot came to a boil quite easily within 20 minutes of our start time. We did have to keep an eye on the fire and make sure to stoke it carefully, but the overall maintenance was the same as an original Solo Stove, except we didn’t have to break the fuel up as much due to the feed door. 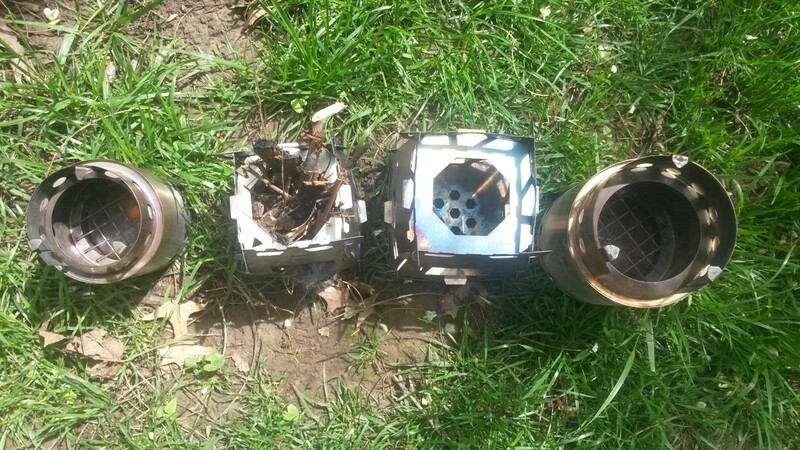 The TLUD plate and Afterburners did their jobs well, allowing the Core M4 stove to reburn the smoke produced from the fire and also keep a drafted and hot fire going to dry wood and boil our water. The titanium Core Stove M4 hits a lot of good marks for us. We don’t think you could make this stove any smaller and get it to gassify as well. It’s a great size, almost the same height as an original Solo Stove, but with a bigger burn box. The whole thing is made of titanium, and that in and of itself is an excellent design choice. With a multitude of options, configuration and parts you can do quite a lot, but overall we think many of these extras might stay at home. The Core M4 stove is probably the best you can get for a lightweight, space space saving, woodgas stove. 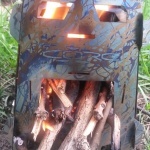 Dollar for dollar, when looking at the Core M4 stove Bio-Reactor kit vs an original Solo Stove, or even the Emberlit which does fold flat but isn’t a woodgas stove, you get a lot more for the money with the Core M4 stove.